We all know that social media is constantly evolving. New features, updated apps, and fresh layouts seemingly happen every day. Thanks to visual platforms like Instagram and Pinterest, the last few years have ushered in more image-driven design features than ever before. Facebook, Google+, and even Tumblr have tailored their updates to place a larger emphasis of size and quantity of pictures seen. Now Twitter is joining the party, and their latest changes aren’t just visual improvements – they could bring huge benefits to small businesses willing to take advantage of them. Let’s walk through a few new features and what you can do to optimize these for your business. 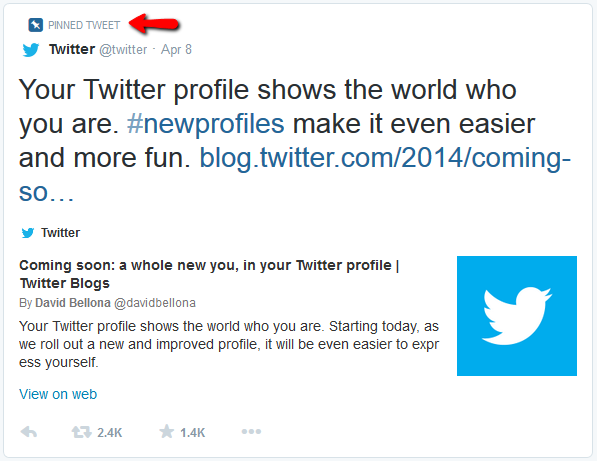 Twitter has addressed its most glaring design flaw. 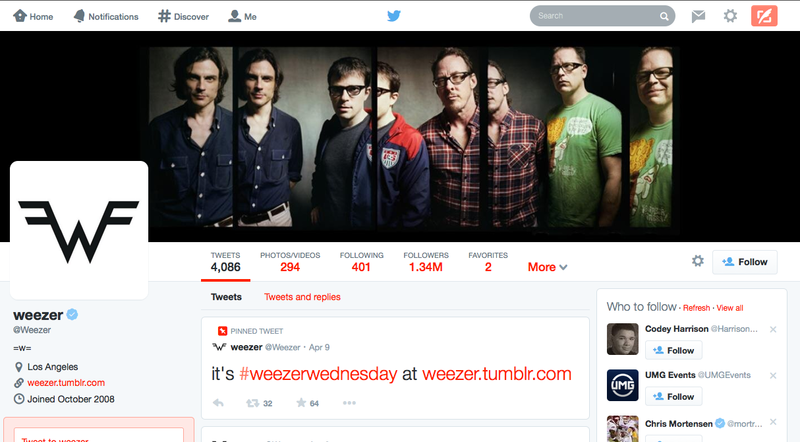 The current Twitter layout places your profile picture right in the middle of your cover photo. This makes it extremely difficult to optimize that space for branding. 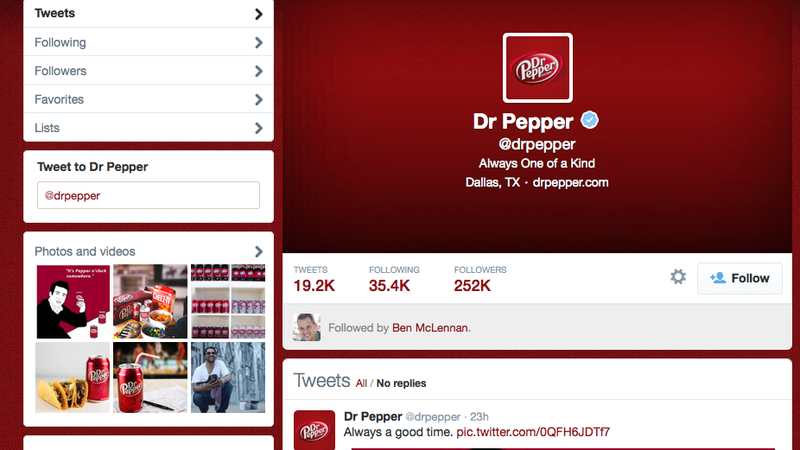 Even large brands like Dr. Pepper have trouble maximizing this space and tend to leave it filled with a solid color. The new banner will expand and shrink to fit the size of the device or browser you are using, so not all of your image will be visible. Images should be 1500px x 500px when uploading, but about 10-15% of your image will be shaved off the top, and another 10-15% shaved off the bottom. The middle 70-80% is the only visible section of the image. Exactly how much is visible and not visible will be determined by the size of the screen it’s being viewed on. For example, we’ve seen a visual created by Lee Smallwood that indicates that the visible portion is 389px, while our own study of @FloydMayweather‘s new header image shows that the visible portion is only 350px. Since we can’t control how the image shows up on a viewer’s screen, be sure that the critical elements of your image are well within the middle 70% and test it out on multiple browsers, devices, and screen resolutions to be absolutely sure. Keeping with the theme of larger images, Twitter has more than tripled the size of your profile picture from 80 x 80 to 256 x 256. The profile picture should hold the graphic or picture that is most strongly associated with your business. Once the new layout is in place your tweets will appear with a larger and cleaner font. The increased size of the text is balanced by the decreased size of the author name. 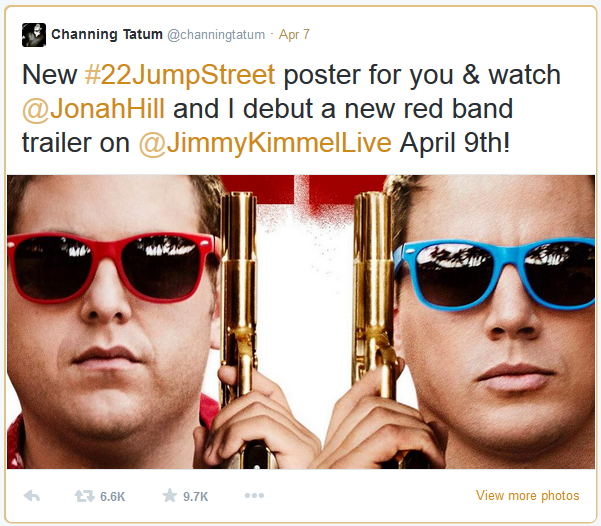 Here’s one from @channingtatum. This small change helps shift the way we view posts, placing more emphasis on the content and less on the creator. With this shift it becomes even more important to produce attention grabbing titles and interesting pictures. Of all the upcoming changes, none will help brands and businesses more than the new pinning feature. 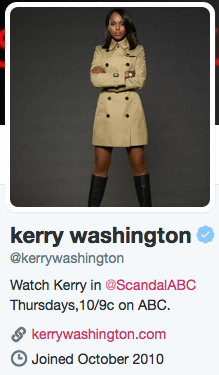 With the new profile comes the ability to “pin” a single tweet to the top of your page for as long as you wish. This will allow you to continue tweeting content to all your followers, while still leaving the most important announcement, news, or advertisement at the top of your stream. The last feature was designed with the reader in mind. When visiting a profile with the new layout the reader will be able to filter the kind of content they want to view in the stream. New options under the new banner will allow users to view tweets, favorites, tweets and replies, or tweets with pictures and/or video. 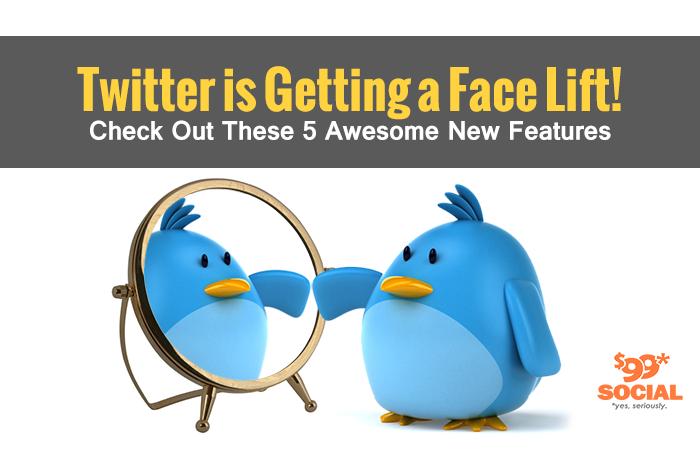 Twitter has not yet announced when the new profile will become available to the general public, but once this update is released you will see a notification across the top of your profile. When that happens, you will have the option to update and, if selected, your profile will adjust automatically. Once the new layout is active Twitter will give you a short tour of the new features. Hire a designer to create a new header image using the specifications we mentioned earlier. Think about how you want to best optimize this space. Find your best high-resolution photo of yourself, or get a new professional headshot taken. Don’t forget to let your personality show through. Think about what you’d like that first pinned tweet to be. Will it include a call to action? Do you need to have a landing page prepared for this? Being prepared in advance will mean that you will be able to update your profile right away and start taking full advantage of the great branding opportunity this new layout will provide.